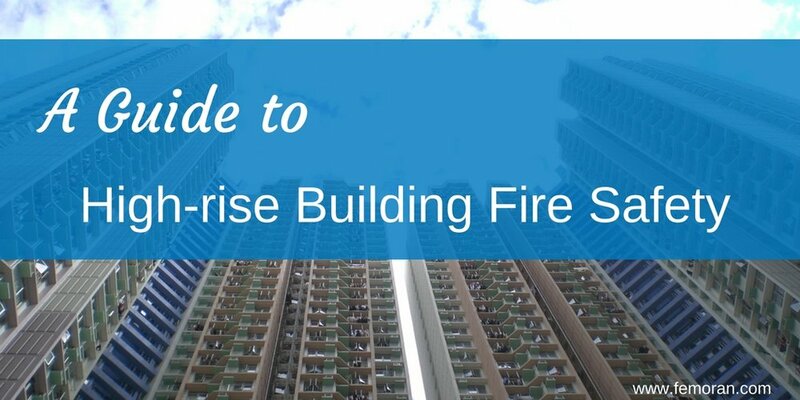 Fire sprinklers save high rise in Chicago. F.E. Moran Fire Protection services the fire sprinklers for the building and is proud to have been a part of this sprinkler save. Parking garage fire sprinklers save Chicago, Illinois high rise from vehicle fire. Firefighters are getting free fire sprinkler training from F.E. Moran Fire Protection National's training program. Within the past 6 months, our fire protection group has trained over 200 firefighters. Before we get into our story today - a very happy New Years to you! We hope that 2018 brings your joy, success, and satisfaction. 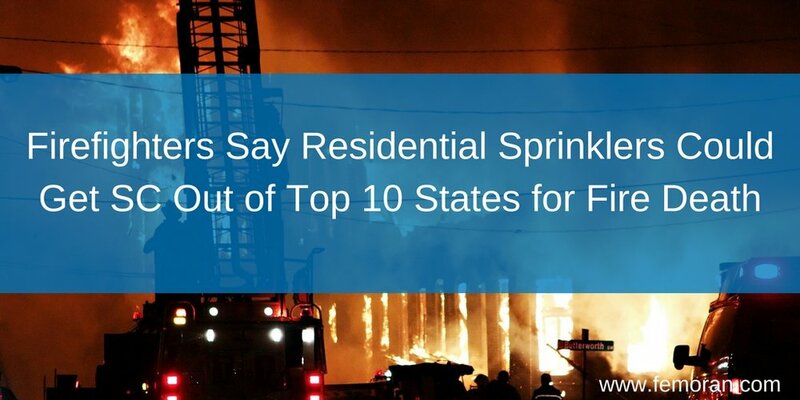 Wisconsin -- The Attorney General, Brad Schimel, said that the state cannot enforce a rule that was established in 2008 that required fire sprinklers be added to all new apartment buildings with three to twenty units. The rule was established by the Department of Safety and Professional Services, and Schimel said that the rule goes beyond their authority. "There is little question that the (opinion) will have a substantial impact on other rules and regulations involving the construction of new buildings and the state's building code, in general. However, the analysis below is unavoidable," wrote Schimel. Madison, Wisconsin's Fire Chief and legislative liaison for the Wisconsin State Fire Chief's Association has called this ruling "extreme." Amy Acton, Executive Director of the Phoenix Society for Burn Survivors says that dropping this rule is going to put lives at risk. In 2008, the state sprinkler rule went into effect for 3-20 unit buildings built after January 1, 2011. The Wisconsin Builders Association challenged the rule. The state Court of Appeals determined the agency had the authority to set the rule because they had a broader authority at the time. Brad Boycks, the Wisconsin Builders Association Executive Director said that he opposes the sprinkler rule because it drives up the cost of constructing apartment complexes. What matters more? The cost of construction increasing or the possible loss of lives? Comment below. Happy Holidays from F.E. Moran Fire Protection! Learn how to handle tenant improvement taxes with these tips on what to ask your CPA. A Pennsylvania retirement home, Barclay Friends, had a 5-alarm fire on November 16. The flames reached 50 feet high and 400 responders arrived, according to the Philly Inquirer. It was a sad situatation, but brought the community together. West Chester University students set up a temporary Red Cross shelter at the Ehringer Gym This effort was headed by student and Friar Society member Joshua Dandridge. The facility had 133 residents and 15 staff members evacuated. Approximately three weeks after the fire it came out that four residents died during this fire. The victims were husband and wife, Delores Parker, 89, and Thomas Parker, 92. Mildred Gadde, 93, and Theresa Mallory, 85 were the other two victims. The cause of death for all four were smoke inhalation. The retirement home did have fire sprinklers (Johnson Controls). The company spokesperson said they are, "assisting authorities and currently gathering information to find out more details about the fire." The NFSA recently completed a burn test, hosted by Assemblyman John Wisniewski. He wanted to show the importance of handling Christmas trees effectively. The U.S. averages 200 fires a year caused by Christmas trees. "This holiday season should be a time of joy, but each year preventable fires caused by Christmas trees and holiday decorations bring tragedy to families all across the country," said Wisniewski. "However, there are simple steps everyone can take to prevent them." According to the NFPA, this is what you should do when choosing a tree. 1. Pick a fresh tree with green needles that do not fall off when touched. You can also choose a fire resistant artificial tree. 2. 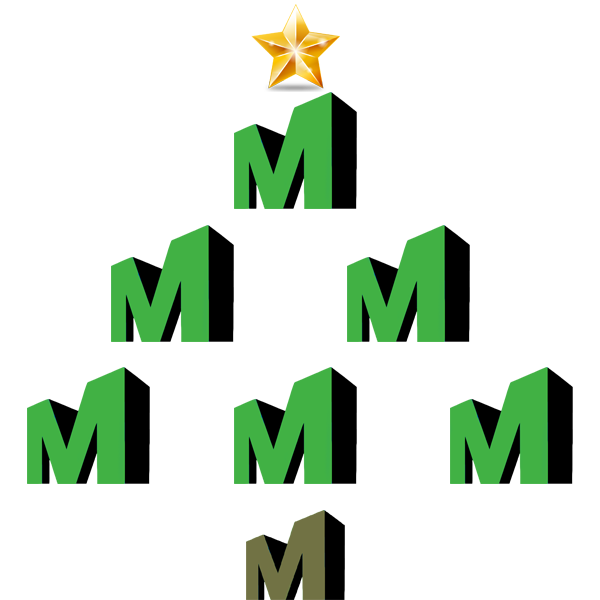 Place the tree at least 3 feet away from a heat source such as a fireplace, stove, candle, radiator, or heating vent. One in every four Christmas tree fires are from a heat source being too close to the tree, according to the U.S. Fire Administration. 3. Add water to the tree stand daily. 4. Make sure the tree does not block an exit. 5. Use lights that have been independently tested in a laboratory and approved for what you are using them for - indoor or outdoor lights. 6. Turn off Christmas lights when you leave the house or go to bed. 7. Get rid of the tree right after Christmas. Dried out trees are a major fire danger. The American Christmas Tree Association says that live Christmas trees cause $13 million in damage annually from fires. So, if you choose to go with a live tree, be safe and take the proper precautions. We are proud to be in the fire protection industry. It is emphasized even more when we see fire sprinkler saves in the news. What better reminder that fire sprinklers matter than to get a glimpse into the lives that have been spared thanks to fire sprinklers? 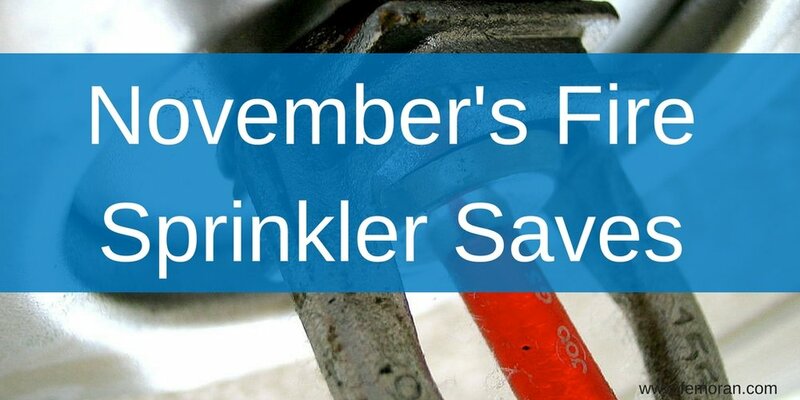 Here are our top five fire sprinkler saves from November. A dryer fire activated fire sprinklers at a Kenosha apartment building. The fire started inside the fire and spread to the laundry room until the fire sprinklers went off. "Once it did enter the room, it came into contact with a sprinkler head, which set off the apartment's sprinkler system due to the heat. It suppressed the fire," said Battalion Chief Matthew Haerter. Firefighters were called to an office building in East Northport when a fire ignited during renovations. When firefighters arrived, they noted that the fire sprinklers activated and extinguished the fire. The fire is under investigation, but it appears that rags soaked in stain started the fire. Fire crews were called to the scene of a condo fire at 9:40am. 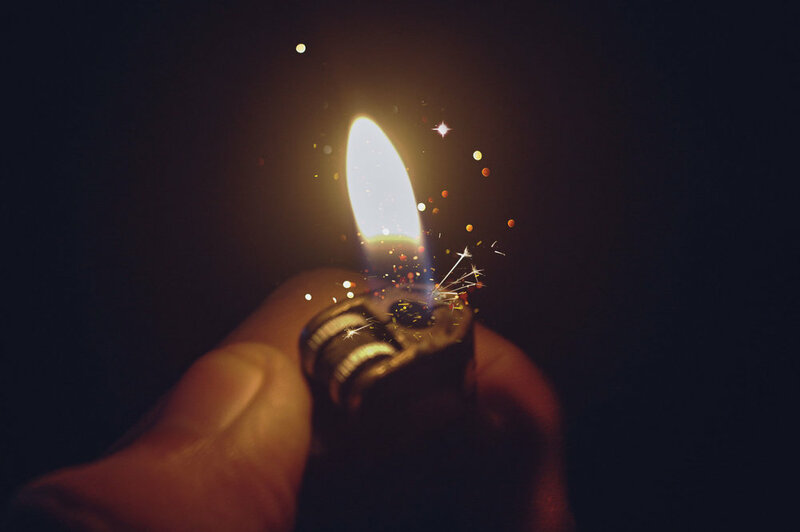 The fire started in a bedroom, caused by unattended candles and incense. "If this hadn't been a sprinklered building, this would have been a significantly different event. Thankfully, the sprinklers kicked in and controlled the fire. It's a good outcome today," said View Royal Fire Chief Paul Hurst. View Royal has a proactive fire sprinkler bylaw that required all new construction of duplexes or larger to have fire sprinklers. This law saved the condo complex! A women's clinic in Temecula was damaged by arson fire. Firefighters were called to the scene around 1am on November 22. When they arrived, the fire was extinguished from the fire sprinklers. 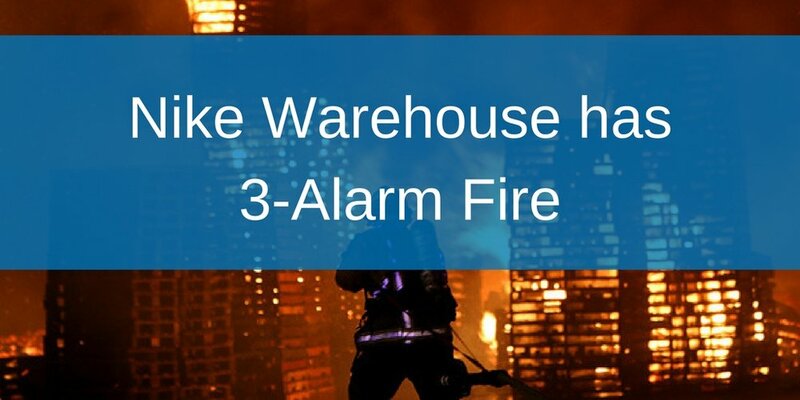 "We were notified about the fire by an alarm company, and by the time our crews reached the location, the fire sprinkler system had extinguished the flames. The contents of one room were damaged," said Riverside County Fire Department spokeswoman April Newman. A walmart in Cedar Park, TX was set on fire by an arsonist. The fires were set inside the Walmart at 1:44am. One in the apparel section, the other in jewelry. Three sprinkler heads activated, and put out the flames. When the news is filled with unfortunate events, it's nice to hear about how fire sprinklers save lives. Firefighters have a lot to worry about. Fires are a real threat every day. Lung issues are a bi-product of their jobs. However, cancer is the real threat. It has now come to light that cancer is killing more firefighters than fires or other health issues. WSAZ followed the story of Keith Pyles, a Huntington Fire Captain who died from cancer after 20 years on the fire crew. The report goes on to say that the CDC/National Institute for Occupational Safety and Health study tracked nearly 30,000 firefighters across the country in 2010 and found higher rates of cancer than the general population. 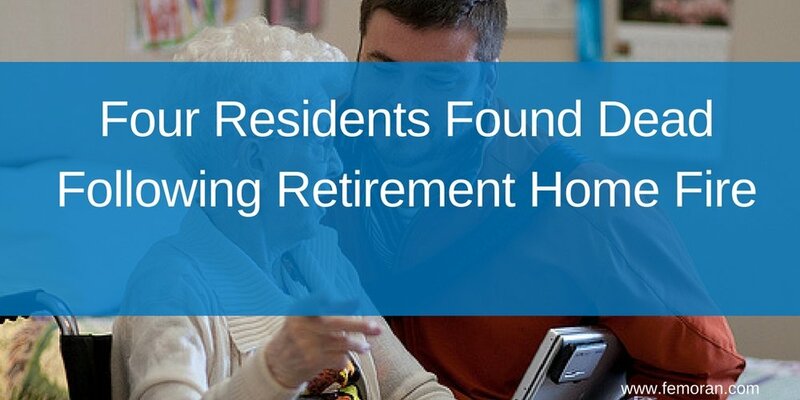 These statistics will hit home for departments across the nation, including in Huntington, West Virginia. It was difficult for the entire crew when a firefighter of more than 20 years passed away from cancer. "I had been on the fire department a little bit longer than Keith," said Jerry Beckett. "Actually, our first few years we worked opposite shifts." Keith Pyles was a Huntington fire captain. Beckett, who know works for emergency services, got to know Pyles through work. Eventually, both men were promoted to captain. 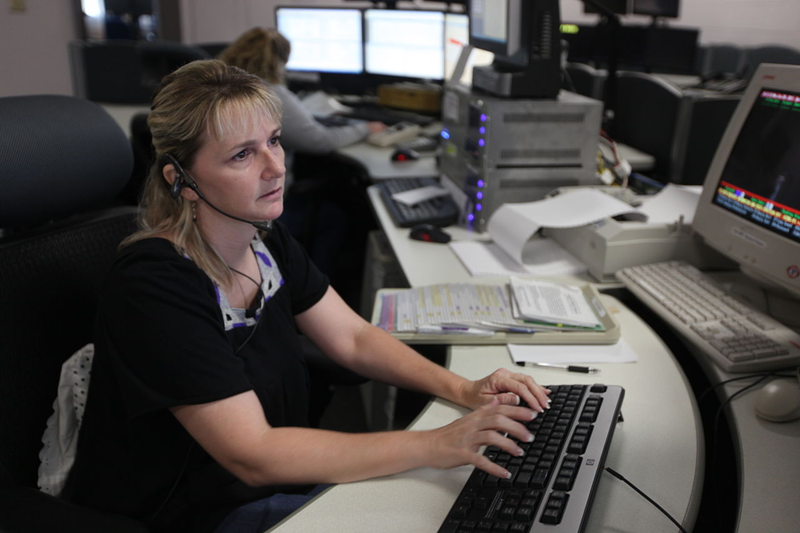 They worked in the same station, but on opposite shifts. Then Beckett was promoted to Deputy Chief and was Pyles's shift commander. The station at 14th Street West and Madison Avenue is where they worked side-by-side. "Keith was a great firefighter," said Beckett. "He was attentative to detail. He wanted to make sure his people were well-trained. He was all about safety. Everybody needed to go home safe and sound, no injuries or anything." Many at the department considered Pyles to be strict -- a character of tough love. Beckett even said Pyle was sometimes difficult to work for early in his career, but softened over the years. "He held a very high standard for himself and expected everybody else to have that same standard," said Beckett. "So he did push his people and he could get hard to deal with sometimes to be honest with you, but he did it all because he wanted to do a good job and he wanted his people to do a good job." 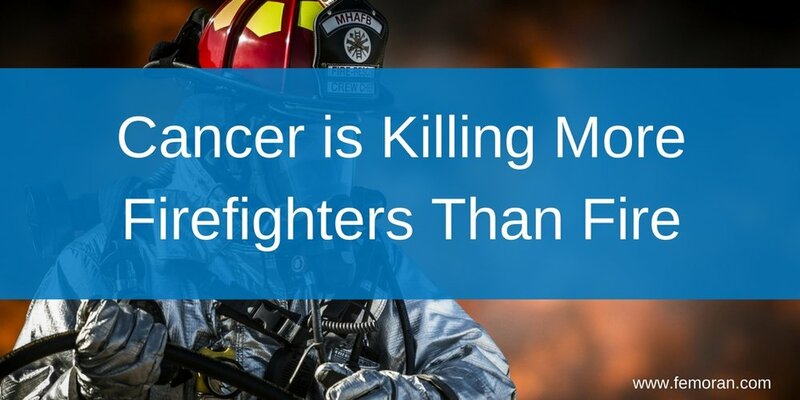 Why are more firefighters dying of cancer than in the past? Researchers say the reason more firefighters are dying of cancer is because of the materials in the properties that they are protecting. Synthetic materials are toxic and cover the firefighters in formaldehyde, ammonia, and other chemicals. Firefighters use self-contain breathing apparatuses, but some of these chemicals can be absorbed through the skin. Perhaps it's time develop some smart technology?